Notice and agenda filed in the office of the City Clerk and posted at City Hall at 6:30 p.m. on Friday, September 28, 2012. These 4th grade Girl Scouts (Troop 23) attended the City Commission meeting as they are working on their Government badge. A. Approval of September # 2 Payroll in the amount of $39,301.27. B. Approval of Claims in the amount of $22,559.71. C. Approval of Minutes from September 17, 2012 Regular Meeting. D. Approval of Cemetery Deeds: Toy McMillim-2 spaces; Rebecca Crabb-1 space; Larry/Brenda Stephens-4 spaces. E. Approval to close Main Street from 7th to 15th Streets from 3:30 p.m. to 4:15 p.m. October 5th, 2012 for the Annual Homecoming Parade. 8. Discussion and possible action to approve Ordinance Number 864 relating to Environment, Part 2, Chapter 20, amending Section 20-25 Adoption of Flood Insurance Study and Flood Insurance Rate Map; providing for severaliability, repealing all Ordinance in conflict herewith and declaring an emergency and effective date. (Required by FEMA New Flood Insurance Study and Flood Insurance Rate Map for Tulsa County). -- Approved, According to Steve Tinker the only changes to the maps were elsewhere in Tulsa County (perhaps Broken Arrow?) but each Tulsa County Community had to approve the change. 10. Discussion and possible action to purchase 2012 Ford F350 Flat Bed Truck for Cemetery/Park Department from Jack Kissee Ford in the amount of $29,863. -- Tabled, with no discussion, per city staff request to further investigate a few open questions. 11. Discussion and consideration of Economic Development in the City of Collinsville. -- Eventually tabled, after discussion. The agenda item was apparently requested by Mayor Herb Weaver who was not at the meeting to provide his input on the subject. The contract with Retail Attractions was recently terminated. A new contract is being considered (item 12 below). Bud York would like performance incentives in any new contract. Collinsville already has an economic development authority (inactive for years) which might be re-activated. 12. Discussion and possible action concerning contract with Stan Sallee regarding Economic Development. -- Tabled after a lengthy discussion. Several spoke in favor of former Mayor San Sallee (and non spoke against) but Commissioner Brad Francis' motion to award the contract to Sallee did not receive a second. Vice Mayor York could not (as he was presiding) and Commissioners Sink & Shafer both declined as they wanted to wait for Mayor Weaver to have his say on the topic so there would be no potential concerns left open. A potential work session was discussed ... and a special commission session has been set for Wednesday Oct. 3rd where the same action can be considered. A. Approval of September # 2 Payroll in the amount of $29,844.84. B. Approval of Claims in the amount of $33,933.30. C. Approval of Minutes September 17, 2012 Regular Meeting. WHEREAS, at the Public Hearing dated September 19, 2012, capital improvement projects were identified that would most benefit the citizens of the City of Collinsville; one such capital improvement project to include the rehabilitation, upgrade and improvements to the American Legion Building, as an honor and tribute to all military who have served our country past, present and future. 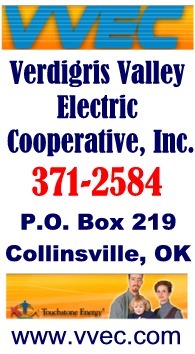 COMMISSION that the Collinsville citizens are encouraged to vote on the Tulsa County Propositions on November 6, 2012. NOW THEREFORE BE IT FURTHER RESOLVED BY THE COLLINSVILLE CITY COMMISSION that it is hereby declared to be the official intent of the Commission of the City of Collinsville to use any Sales Tax allocated to the City of Collinsville, Oklahoma, to provide revenue for the purpose of acquiring, constructing, furnishing and equipping capital improvements to be owned by the City of Collinsville, Oklahoma. NOW THEREFORE BE IT FURTHER RESOLVED BY THE COLLINSVILLE CITY COMMISSION that representatives of the Collinsville Economic Development Authority, with the assistance of City Staff, are hereby requested to help identify capital improvement projects that will benefit the overall health, safety and welfare of the citizens of Collinsville. Projects will then be submitted to the Collinsville City Commission for consideration and approval. ADOPTED BY THE COLLINSVILLE CITY COMMISSION THIS 1ST DAY OF OCTOBER, 2012.